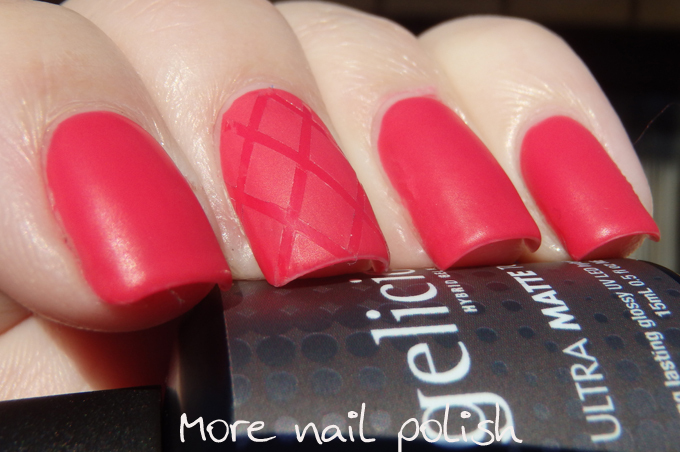 Aussie hybrid gel polish brand Gelicious recently added a gel matte top coat to their extensive range of gel polish colours. Tonight I have swatches of the matte top coat so you can see the effect it provides in real swatches. Here are some observations and suggestions about using the gel matte top coat polish. The matte top coat is very thin compared to all the other Gelicious shades, and I mean watery, so it's a big difference when using it. Although that said, it was very easy and quick to apply and didn't added any thickness to you mani. The finish is more of a satin or rubber finish rather than a completely flat matte finish. The matte finish lasts longer on your nails than regular matte top coat, simply because it's a gel polish and does 'shine up' or rub away like regular matte top coat. Applying more coats of the gel matte top coat doesn't make the effect more matte, it's looks the same whether its one coat or five! If creating nail art using tape or nail vinyls, cure before you peel the tape/vinyl off, otherwise the design will loose it's sharp edges because the polish is very thin. 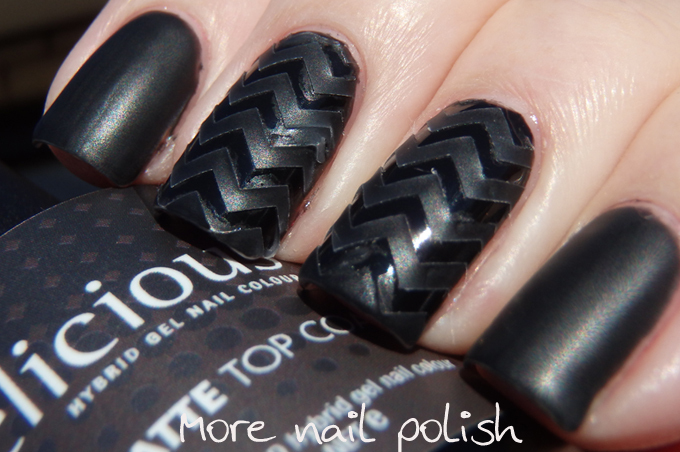 If creating nail art using tape or nail vinyls, stick with just one coat, otherwise the edges become quite rough after you pull off the tape/vinyl. 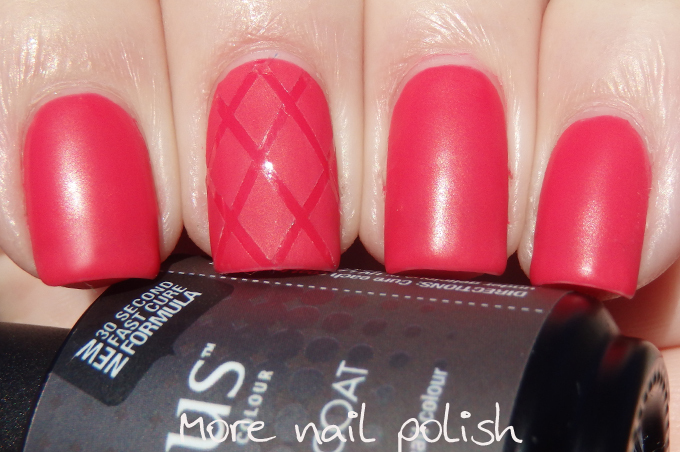 For this mani, I tested out using two coats of Gelicious Ultra Matte Top Coat over a base of Gelicious Sleep til noon. 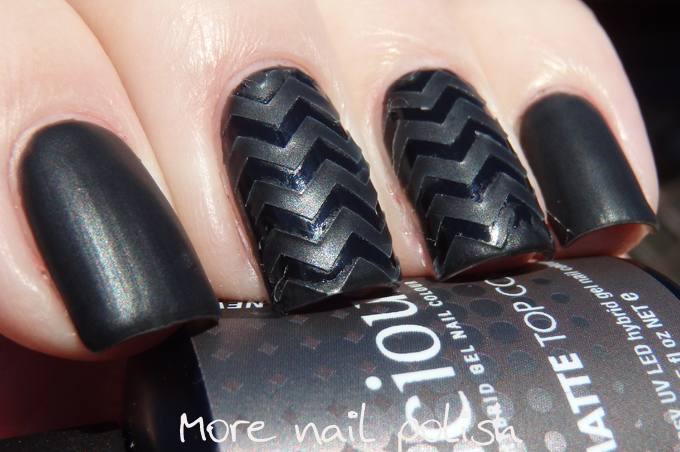 Used zigzag nail vinyls on my two centre fingers. I found that the top coat did manage to seep in under the edges of the vinyls even though I thought I had pressed them down really well. Because I did two coats, the edges of the zigzags were a little rough. For this mani I did a simple one finger feature nail using striping tape. This is one coat of Gelicious Ultra Matte Top Coat over Gelicious Just. Using one coat of matte top coat resulted in a much smoother finish and this effect looked really good. 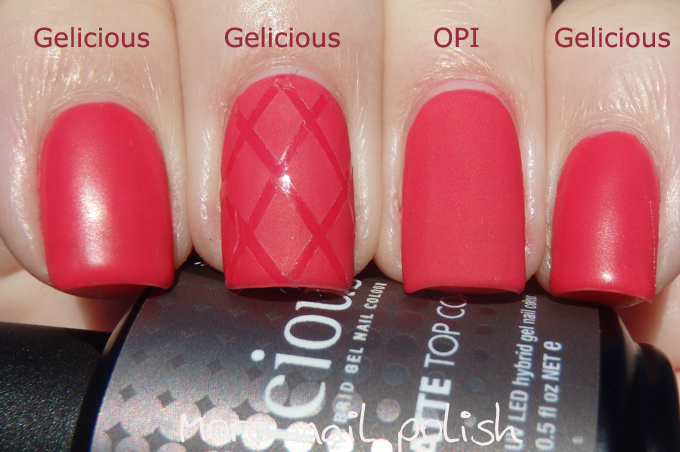 Here is a comparison shot of how Gelicious Ultra Matte Top coat compares to OPI Matte top coat, which is not a gel shade. OPI Matte Top coat is the most flat matte finish polish I own, and as you can see, it looks very matte compared to the Gelicious matte top coat. I struggled to create a matte mani with a shiny french tip, I just wasn't able to get a sharp smooth line with out tape, and when I did use tape I ended up with a thick ridge that didn't look nice. 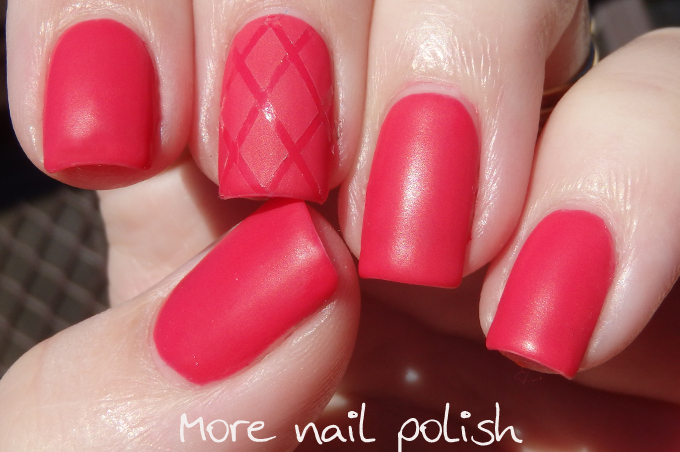 I was using the regular gel top coat and then the matte top coat on the nail except the tip. Then I read this on the Gelicious Facebook site "Rather than doubling up on top coat, we recommend using a small brush to create the edge on the ULTRA MATTE TOP COAT, then fill in the rest of the base of the nail. Cure, then apply the ULTRA GLAZE TOP COAT to the tips. 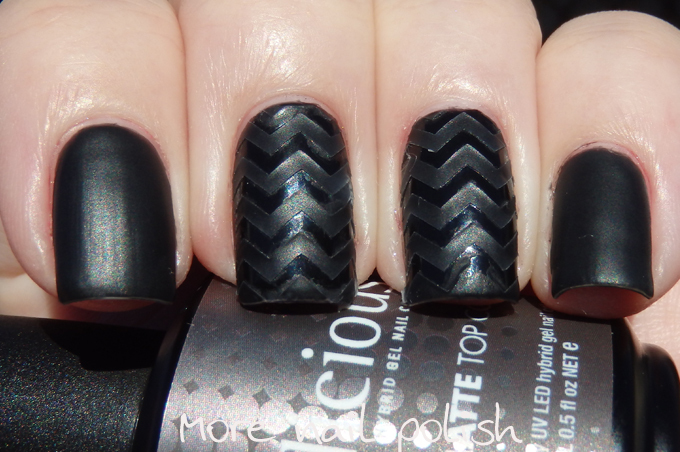 The line you created with the MATTE top coat creates a nice line to follow. Tidy up with a paint brush dipped in remover if needed, then cure". I will definitely try this next time I'm doing the shiny french tip to see if I get a better result. 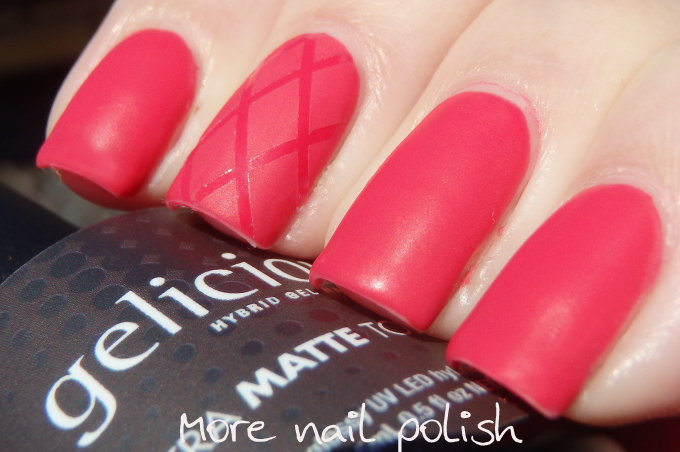 The Gelicious Matte Top coat is available now from the Gelicious shop.